As high school students, brothers Stephen and Vincent Della Pietra participated in a science honors program at Columbia University. The innovative science and technology they learned about opened their eyes to a world of possibilities and has been a major influence throughout their lives, the brothers say. They both went on to earn undergraduate degrees in physics from Princeton and doctorates in physics from Harvard. 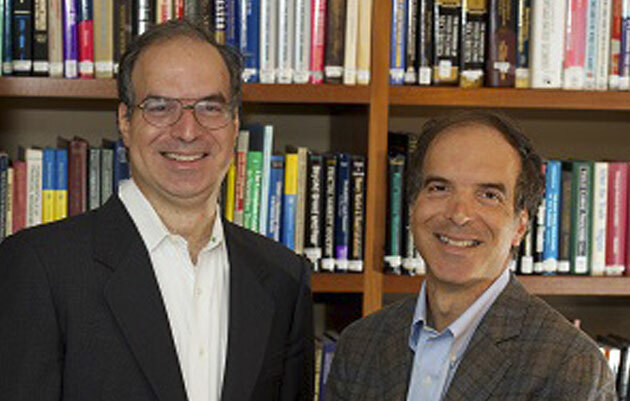 After conducting postdoctoral research at the Institute for Advanced Study, Stephen and Vincent forged rewarding careers at IBM, where they worked on statistical pattern recognition, and at Renaissance Technologies, the hedge fund where they both manage research groups. Now Stephen and Vincent, along with their wives, Pamela Hurst-Della Pietra and Barbara Amonson, have channeled their professional success and lifelong love of science into a leadership gift that will create the Della Pietra Chair of Biomedical Imaging at Stony Brook. Their $1.5 million gift, with a matching gift from the Simons Foundation, will have a total impact of $3 million. The University plans to recruit a nationally renowned researcher to fill the new position later this year. The Della Pietra Chair of Biomedical Imaging will play a crucial role in the medical school’s strategic plan, which focuses on cardiovascular, neuroscience and cancer research, says Ken Kaushansky, MD, Dean of the School of Medicine, and Senior Vice President of Health Sciences. For Stephen and Vincent, the gift represents not only their intellectual interests in biomedical imaging, but also an opportunity to improve medical technology in their own backyards and around the globe. A key part of that goal will be recruiting the right leader to fill the Chair and guide a team of cutting-edge biomedical imaging researchers. Those advances could include understanding how autism affects the brain, the ability to diagnose heart disease earlier, and figuring out why some cancer patients respond to therapies while others don’t. Harnessing the power of current imaging technologies will be an important part of the Chair’s job, he said. Imaging equipment, such as CT scanners and MRIs, often arrives from the factory with pre-set parameters that are tuned to the average user’s needs. A top-notch researcher, however, knows how to tweak those settings and push the equipment to perform more accurately and with greater precision. The right candidate will likely come from a radiology background, he said, but they will also need to understand the world of big data, since modern imaging equipment yields remarkably large data sets. The researcher recruited for the Chair will not only need to be well-versed in data processing, but also able to speak the language of mathematics and the language of clinical medicine, and collegial, so he or she can work with many specialties and across multiple areas of imaging science, Dean Kaushansky added. The Chair will be responsible for creating a collaborative environment within the School of Medicine and across many disciplines at Stony Brook, from computer science and applied mathematics to psychology and biology, President Stanley emphasized. For example, behavioral scientists at Stony Brook have been using functional magnetic resonance imaging, or fMRI, to study cognitive motor processes, emotions and personality. Dean Kaushansky is hopeful that the new Chair in Biomedical Imaging will work with scientists like these to advance fMRI technology and expand Stony Brook’s imaging capabilities. That possibility is especially interesting to Pamela Hurst-Della Pietra, D.O., whose background is in children’s health. She recently launched a foundation studying the impacts of digital media on children and adolescents. A portion of the Della Pietra family’s generous gift will also go toward establishing a program for gifted high school students — one similar in spirit to the science honors program that inspired Stephen and Vincent years ago. “That experience was great. We met students there that we continued to encounter many times in many different settings throughout our careers,” said Stephen.